Closed out her career in the Garnet and Gold by leading the Seminoles to their fourth consecutive ACC Championship and fifth-straight appearance in the NCAA Super Regionals…2017 team captain and played in 63 games, including 62 starts…batted .299 (53-for-177) with 12 doubles, two home runs, 40 RBI, 36 runs scored, 23 walks and 10 stolen bases…ranked sixth in the nation with six sacrifice flies…ended her career with 122 RBI, which sits No. 10 on the all-time list in FSU history…tallied 11 multi-hit games and eight multi-RBI games…finished second on the team with 20 two-out RBI…batted 3-for-3 with a stolen base and two runs scored against Furman on February 11…walked twice, scored a run and placed the sacrifice bunt in the seventh inning that drove in the winning run in a 3-2 win over Northwestern on Feb 17…went 1-for-2 with a double and two runs scored against Nebraska on February 19 in the ACC/Big Ten Challenge…hit a double, walked three times, drove in two RBI and scored two runs against Stanford on February 23…went 1-for-2 with a double and a run scored In FSU’s 2-1 win over No. 6 UCLA (Feb. 26)…batted 2-for-2 with a double, two hit-by-pitches and two runs scored against No. 14 Michigan…went 1-for-3 with a sac bunt in FSU’s 4-0 win over Georgia Tech on March 3…walked and scored a run in her only plate appearance on March 5 against GT…drew a career high-tying three walks and scored a run in game two of the doubleheader against North Florida on March 8…hit a double and scored two runs against Virginia Tech in the first game of the doubleheader on March 10…drove in three runs and added a double versus Florida Gulf Coast (3/14)…went 2-for-3 with two RBI against FGCU on March 15…walked twice and stole a base against Notre Dame on March 17…scored a run and drew a walk on March 19 vs. Notre Dame…opened the scoring with an RBI double at UCF on March 22…drove in a run and scored one of her own on March 24 at Virginia…tied a season high with three hits, including a double, with an RBI and two runs scored against Pitt on April 1; and defensively, was part of a triple play in the sixth inning, catching a ball from Jessie Warren at second and firing to Carsyn Gordon at first…hit her first home run of the season on April 2, a three-run home run in the sixth inning of FSU’s 5-0 win over Pitt…drove in five runs, including a grand slam, and scored two of her own on April 8 at Syracuse…walked twice, stole two bases and drove in a run in the first game of the DH at Syracuse (4/9)…batted a combined 5-for-7 with a double, a walk and two RBI in the doubleheader at Troy on April 18…had two hits in game two of the doubleheader at Louisville on April 23…recorded a hit in all three games at No. 5 Oregon…went 2-for-3 with two RBI against Virginia in the quarterfinals of the ACC Tournament (5/11)…hit a double, stole a base and scored a run against No. 25 Georgia on May 20…batted 2-for-3 with a double and an RBI in the first game of the NCAA Super Regional against No. 18 LSU on May 26…drove in two runs, including an RBI single and a sacrifice fly, in FSU’s 6-4 defeat to LSU on May 28. 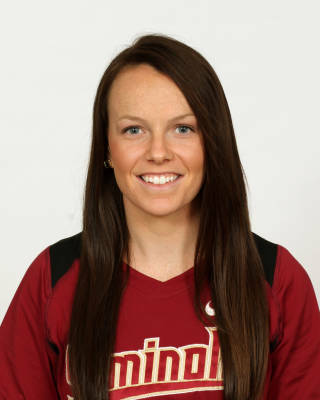 Named to the NFCA Southeast All-Region Second Team and All-ACC First Team after helping lead the Seminoles back to the Women’s College World Series for the second time in three seasons…started all 65 games at second base and finished with a .353 batting average (66-for-187) with nine doubles, five triples and five home runs…the five triples led the ACC and were tied for No. 16 in the NCAA…drove in 47 RBI, scored 50 runs and also added 23 walks and eight stolen bases…led the team with a 16-game streak of reaching base from February 20 to March 19…had a 10-game hitting streak and recorded 18 multi-hit games and had 13 multi-RBI games…went a perfect 2-for-2 with two RBI and a run scored against LIU Brooklyn on February 13…walked twice and scored a run against Illinois…recorded one hit with two walks, two RBI and two runs scored to help beat Valparaiso on Feb. 14…went 1-for-2 with two RBI against No. 20 Minnesota on February 20…hit her first career home run on against Hofstra on Feb.26…scored two runs on two walks against UAB on Feb. 28…hit a perfect 2-for-2 with a double in a win against UCLA on Mar. 4…batted 2-for-3 with a stolen base and two runs scored against CSUN (Mar. 5)…batted a perfect 2-for-2 with two stolen bases and a RBI against UC Davis (Mar. 5)…hit 2-for-3 with two RBI against Cal State Fullerton (Mar. 8)…had two hits (a double and a triple) in a win against Tulsa on Mar. 12…hit her second triple of the season against Syracuse on March 20…was 3-for-4 with a double, home run and five RBI against UNC (Mar. 25)…hit a three-RBI triple on the road at No. 22 Notre Dame on April 3…went 5-for-10 with three RBI and four runs scored in the series against NC State (April 8-10)…batted 2-for-3 with three RBI and two runs scored to go along with a home run against Boston College on April 16…tied a career high with three hits at No. 3 Auburn on April 20…tied her career high by going 3-for-3 at the plate against Virginia Tech on April 23…went 3-for-3 with a grand slam against UCF on April 26…posted a career-high four hits and scored three runs at Pitt on April 30…had two hits with three RBI and two runs scored in a 15-5 win at Pitt on May 1…hit a solo home run in the ACC Championship Game against No. 20 Notre Dame on May 14…batted 2-for-4 with a run scored against Utah in the NCAA Super Regional on May 28…went 1-for-2 with a walk, HBP and a run scored against No. 5 Auburn in the WCWS semifinals on June 5. Earned All-ACC Second Team honors and batted .333 (55-for-165) with seven doubles, two triples, 26 RBI and 34 runs scored…also had 20 walks, seven stolen bases and was hit by 10 pitches…finished third on the team with 16 multi-hit games and also had six multi-RBI games…was named to the Capital One Academic All-Region First Team for District IV for her accomplishments on the field and in the classroom…earned the team’s Golden Nole award for her work with community service, as well as the Most Improved award…named to the All-ACC Academic Team…was hit by three pitches in the same game at Florida A&M on February 10…went 2-for-4 with an RBI and a run scored versus No. 7 Michigan on February 14…tied a career high with three hits as she went 3-for-4 with a run scored and a stolen base against No. 20 Cal at the Mary Nutter Classic on February 21…batted 1-for-3 and tied a career high with three runs scored versus Oklahoma State on February 20…tied a career high with three hits against Bethune-Cookman on March 6, added two RBI and two runs scored in the game as well…set a career high with three runs scored on March 10 as FSU defeated Florida Atlantic, 12-0 in six innings…had a base hit and scored a run versus USC Upstate on March 12…came off the bench and went 2-for-3 with an RBI against Notre Dame on March 14…hit a walk-off double against Colgate in a 8-0, five-inning win on March 17; finished the game 2-for-3 with two RBI and a walk…hit two doubles in game two of the doubleheader at No. 25 Virginia Tech (3/21), including a two-run, two-out double to tie the game in the seventh inning as FSU would go on to win 7-6 in eight innings…went 3-for-4 with a run scored against No. 9 Auburn on March 25 to tie a career high in hits…batted 2-for-3 with a two runs scored and an RBI against Florida A&M on April 1…went 2-for-2 with two walks and a run scored at NC State on April 4…had a single, two walks and two runs scored at Louisville on April 12…was 2-for-3 with a triple and a career-high three RBI against Virginia in game two of a doubleheader on April 18…batted 2-for-3 with two RBI and a double in the final game of the series at Georgia Tech (4/26)…drove an RBI double off the wall, scored two runs and drew a walk in FSU’s 15-1 victory at North Florida on May 3…hit a single and added a sac fly versus NC State at the ACC Championships on May 8…had a two-RBI single against Dartmouth in the NCAA Tallahassee Regional on May 15…drove in a run on a sacrifice fly against No. 13 UCF on May 17 in the regional championship game…went 2-for-3 with a run scored and an RBI in game two of the NCAA Knoxville Super Regional at No. 8 Tennessee. Provided the Seminoles with defense as both an infielder and outfielder…appeared in 53 games and started 12 games at first base and 11 games in left field…showed her versatility with appearances at many other positions and would often pinch-run as well…finished her first season with a .246 batting average (17-for-69) with three doubles, nine RBI, 14 walks and 21 runs scored…hit a double and added two walks with an RBI and a run scored at New Mexico State (2/7)…went 3-for-3 with two RBI and a run scored in FSU’s 9-0 victory vs. North Dakota State on February 15…scored a career-high two runs three times during the season – vs. Southern Miss (2/15), vs. Charleston Southern (2/21) and vs. UC Santa Barbara (2/22)…went a perfect 1-for-1 with a career-high two walks, an RBI and a run scored in FSU’s 5-4 victory over No. 25 Auburn on February 26…hit a walk-off two-RBI single against FAMU on March 26…hit a pinch-hit RBI single in the ACC Semifinal against North Carolina on May 9…crushed a double to center to lead off the sixth inning against Baylor at the Women’s College World Series on May 31. A three-year letterwinner at Rockwood Summit…enjoyed a fine senior season, being named Suburban South Conference Player of the Year…also a first-team all-state selection, a first-team all-conference and region pick, the team MVP and the offensive player of the year as a senior…earned second-team all-state honors as a junior while being named team MVP, offensive player of the year and first-team all-conference and region…Suburban South Conference Player of the Year following her sophomore season…first-team all-conference and region and a second-team all-state performer…honor roll student all four years…earned the board of education award in her sophomore and senior years. Born on Dec. 30, 1994…majoring in Sport Management…daughter of Russell and Stacey Cooper…originally from Wellington, New Zealand…has ambitions of being a college softball coach…has one brother and one sister…her father played professional fast pitch softball…has competed internationally for New Zealand since 2011, named captain of the White Sox for the 2016 season…enjoys playing at Louisville because they have a great facility and atmosphere…would like to add Oregon to the schedule…favorite movie is The Heat…favorite ice cream is cookie dough…cannot live without music…favorite artist is Eminem…can play the drums…she mostly watches ESPN and `Pretty Little Liars’…loves wearing earrings…describes her style as athletic…envies celebrity actress Sandra Bullock because `she is hilarious’…enjoys a good chicken and dumplings home-cooked meal…wears No. 14 because it was the number her father wore…sports idol as a child was Natasha Watley… hopes to someday meet Derek Jeter…most memorable win was defeating Michigan in game three of the 2014 NCAA Super Regional.